What a BUSY 24 hours it has been! I feel like it has been DAYS since my last entry, and it has only been hours! 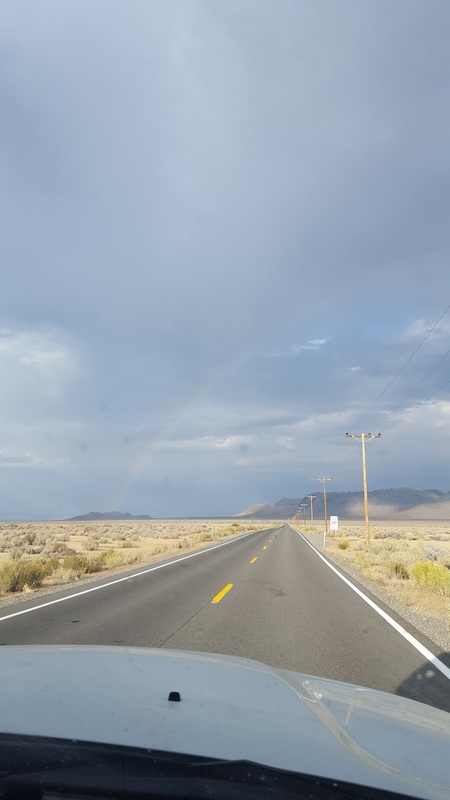 We left the grimy, busy Reno area and headed south on 395 again. 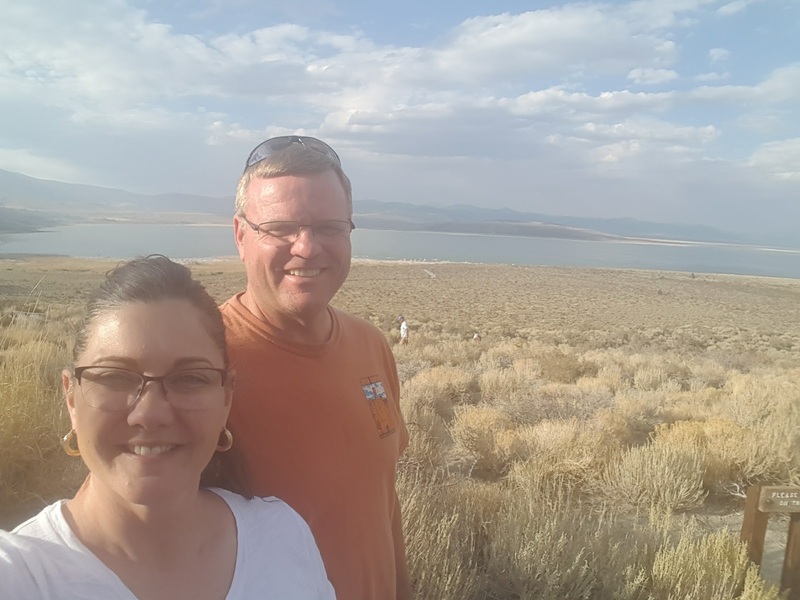 This was new territory for us, we had never ventured further south on 395 when we lived in Herlong, California all those years ago. Our plan was to get down into some of the good boondocking areas in the lower Sierra Nevadas that the West is famous for. I have read countless inviting blog posts from other RVers who have had so much fun down here. Eventually we knew we would be headed into Yosemite through it's east entrance on highway 120. We are fighting weather as a cold front is supposed to be headed in, and we wanted to make it over Tioga pass. Tioga pass is the highest elevation passing in the West and exceeds 10,000 feet in elevation. As we came down into the valley in the town of Lee Vining we were dazzled by the sight of Mono Lake spread out below. WOW it was amazing to see! The shorelines are crusty white with the alkalinity of the water. I won't go into all of the amazing facts about this natural wonder here, but it's crazy amazing. We knew we had to stop here for the night, so we found some gorgeous boondocking areas and picked our spot. We were like the only people on earth and had a very quiet night among the big pines growing out of the light and fluffy pumice gravel that was so odd. Very difficult to drive in, we had to use 4 wheel drive. Next morning we pulled in the slides and headed over to the lake to see what we could see. 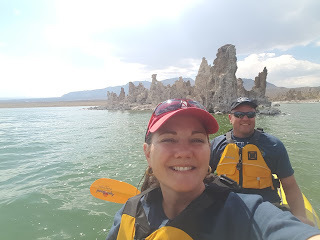 Our amazing paddle on Mono Lake among the Tufas... AWESOME! We learned of the cold front coming in today and high winds were expected... so we were uncertain as to whether we would be able to break out the Banana Boat or not. Dad was actually more nervous about it than me (isn't that a first?). We hiked through the South Tufa area and were awestruck by the weird, ghostly spires that were formed over thousands of years when that area used to be under water. The very salty lake water (2 and half times SALTIER than the ocean!) mixes with the fresh water coming in through underground springs and the bicarbonate (think baking soda) causes a chemical reaction as the underground water bubbles up and builds the spires. Of course, Los Angeles has laid claim to much of the tributary streams and rivers that used to keep this lake filled, and so now the Tufas stand as grim sentinels, a testament to the depletion of the water supply in the region. The lake isn't nearly as large as it used to be. 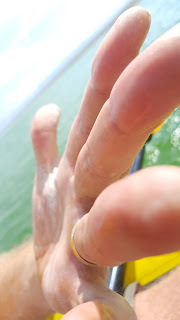 Check out the SALT on Dad's hand! We were covered with it! Because the water is so dense with salt, buoyancy is greatly enhanced. They say that it is almost impossible to sink when you are swimming in it. We didn't swim, but we did wade in to launch the boat. It has a crazy, slippery feel. When the water dries, every surface is covered in white salt. Our glasses, our clothes and our skin was powdery white. Though the wind had picked up measurably, we just had to risk a quick paddle in the lake around the Tufas. We are SO glad we did! Within minutes after getting off the water the weather arrived... Whew! We loaded up and headed out 120 for YOSEMITE!! WOO HOO!! We will update you tomorrow! We miss you all so much! Watch for more Facebook LIVE broadcasts! Love, Mom.